This case report describes the evaluation and treatment of an eight year old spayed female Pit Bull Terrier, who presented three days after becoming acutely non-weightbearing on the right hind leg. Physical and lameness examinations were performed. A cranial drawer test as well as radiographic findings supported a diagnosis of cranial cruciate ligament injury. The owner wished to avoid surgery for the problem and therefore medical management with electro-acupuncture, stifle brace, NSAID therapy and joint supplementation was initiated. After 9 sessions, her lameness has significantly improved and she has discontinued NSAID therapy. She exhibits a grade 3/5 right hind lameness, however, she is weight-bearing and uses the limb approximately 90% of the steps she takes. Sapphira, an 8 year old spayed female Pit Bull Terrier presented to the clinic three days after becoming acutely non-weightbearing on the right hind leg. The owner began daily firocoxib to alleviate any pain and inflammation associated with the injury. When this treatment failed to resolve the lameness, Sapphira was brought in for evaluation. She lives on a horse farm where she is allowed to roam free. She sometimes chases the farm animals. Her body condition score at presentation was a 7/9. On presentation, Sapphira was non-weightbearing on the right hindlimb. All vital parameters were within normal limits. A full lameness assessment was performed. She exhibited minor pain on palpation and passive flexion and extension of the right stifle. A cranial drawer sign was present and radiography of the stifle was performed. The radiographs of the right stifle revealed an increased opacity in the cranial joint space and bulging of muscular fascial lines both of which are consistent with cruciate injury. During a myofascial exam at presentation, very tight bands were felt throughout the entire dorsal and lateral neck and shoulders. Sensitivity along the longissimus dorsalis was noted as twitching of the skin from the mid-thoracic region to the sacrum. The decision to use electro-acupuncture to treat the right stifle was based on three broad categories. First, acupuncture around the area of injury will cause vascular changes. The vascular changes will increase oxygenation of tissue, provide nutrients to the joint and surrounding tissues and stimulate removal of inflammatory cytokines and reactive oxygen species that would lead to damage to the joint and surrounding tissues. In addition to the vascular changes, acupuncture in the affected region will modulate the immune system promoting the transition from a pro-inflammatory state to an anti-inflammatory state. This will facilitate healing of the injured tissues as well as decrease the secondary injury to adjacent tissues due to pro-inflammatory cytokine production and recruitment. The second broad category is neuromodulation. Acupuncture of the spinal cord segments in the lumbosacral region as well as around the site of injury will stimulate the nerves supplying the surrounding musculature and the joint itself. This will support the normal function of these structures. Strengthening the hamstring muscle group and quadriceps through this neuromodulation is important to bring stability back to the stifle joint because they act as agonists of the cranial cruciate ligament. In addition to providing this support to the affected limb, treating the weight-bearing limb in a similar manner will allow continued health of the unaffected stifle. In doing so, hopefully reducing the risk of a cruciate injury in that limb. The third broad category is myofascial release, analgesia, and relaxation of overused compensatory muscles. 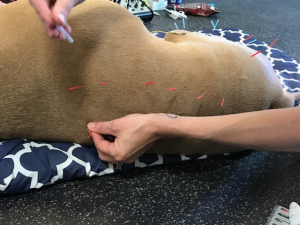 For this dog, significant tightness was palpated on the dorsal neck and sensitivity was identified in the lumbosacral musculature. Acupuncture here loosens those areas of tightness and releases the fascia so the muscles and nerves can function properly. 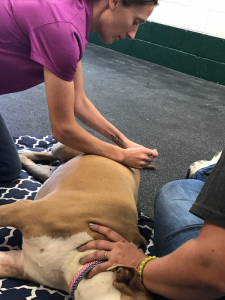 Sapphira’s treatment plan was based on the fact that her injury was acute and she was seen relatively quickly after the owner noticed her lameness. Initial treatment sessions were performed twice-weekly with electro-acupuncture. The frequency of treatments was decided based upon the owner’s schedule, financial considerations and the patient’s response to therapy. After 4 treatments at this frequency, Sapphira showed moderate improvement. Her treatments were then decreased to once weekly. A stifle brace was also utilized during daytime hours when Sapphira was active and taken off at night, and she was started on meloxicam for its anti-inflammatory effects. 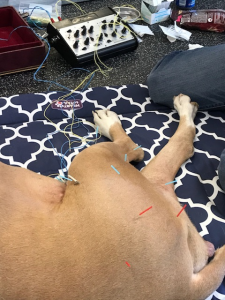 The points used at each acupuncture session varied slightly, but every session began with GV20 to encourage relaxation and stimulate release of endogenous opioids and endorphins. GV14 was used for this purpose on some occasions as well. To address the right CCL injury directly, the following local points were used at each session: SP 10, SP 9, ST 34, ST 36. These same points were used on the contralateral stifle as well. Since Sapphira also exhibited proprioceptive deficits in the limb, she was treated with BL 39 or BL 40 to encourage popliteus muscle stimulation. Gallbladder 31-34 and BL 36-38 were also used to support the sciatic nerve and hamstring muscle group as agonists of the CCL. Again, many of these points were also used in the contralateral stifle. Points along the Bladder line were used at each session. Each time, BL 23 and BL 25 were used bilaterally as central points for the pelvic limbs. In addition to these points, other lumbosacral points were added based on myofascial palpation at each session. These included BL 20, 21, 22, 23, 25-29. There were some occasions that Sapphira had a significant amount of tight bands in the brachiocephalicus, sternocephalicus and trapezius muscles on the dorsal neck. This was managed with acupuncture of cervical spinal points and massage. 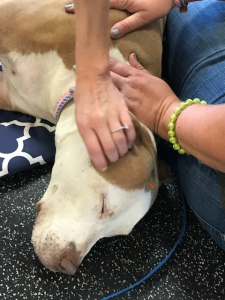 Sapphira has been receiving acupuncture treatments for a total of 10 weeks. She was completely non-weight bearing at the beginning of treatment. She would stand on the dorsal aspect of her metatarsal bones more frequently than on the plantar aspect. The proprioceptive problems are likely secondary to the inflammation associated with the injury of her right hindlimb. The nerves and the muscles near the stifle would be affected by inflammation including swelling, white cell and cytokine influx into the area, altering their ability to respond to normal proprioceptive cues from distal/peripheral nerves. Therefore, Sapphira was not fully aware of her foot placement. In addition, because of this inflammation, the muscles responsible to place the foot properly were not able to execute that placement accurately. After the first two treatments, her proprioceptive deficits had begun to improve; she began standing on the plantar aspect of her right hind foot. She also began toe-touching on the right hind. By the eighth treatment (at 6 weeks), she was still a grade 4/5 lame on the right hind, but weight-bearing and using the leg 85% of the time. At her tenth treatment (10 weeks after initial injury), she was an improved grade 3/5 lame on the right hind and was using the leg much more normally. This improvement is likely the result of the acupuncture treatments as well as the joint support provided by the stifle brace. The NSAID therapy was discontinued after 2 weeks and was only given when the owner noticed an increase in lameness over several days. The owner also started Sapphira on an oral joint supplement with Omega-3 fatty acids as well as glucosamine and chondroitin. This case highlights the success that acupuncture can have in patients who had previously been told surgery is the only option. Even I have been told by multiple small animal surgeons that surgical treatment for cruciate disease is not just the only option, but that if it is not done expediently, the dog will suffer from terrible and debilitating arthritis. This owner was unwilling to pursue surgical treatment (ie. tibial plateau leveling osteotomy-TPLO) for this dog. This was for a number of reasons, including the strict cage rest that is required following surgery and the long recovery period. Sapphira’s significant improvement in the first 8 weeks of treatment proved to me that there are other, non-invasive options for treatment of cruciate disease. In addition, Sapphira was not subject to undue cage confinement, which made her owner very happy. There are several studies that have seemingly cast doubt on the inhibitive effects of TPLO on the development of arthritis. In an article from the Canadian Veterinary Journal in 2012, entitled “Comparison of radiographic osteoarthritis scores in dogs less than 24 months or greater than 24 months following tibial plateau leveling osteotomy,” DeLuke, et al found that stifle osteoarthritis did increase after TPLO surgery in all dogs and that the degree of arthritis was not dependent on time. The results of this study confirmed the results from previous studies, including Lineberger, et al in 2005, Hurley, et al and Boyd, et al in 2007 that osteoarthritis indeed progresses after TPLO procedures. I do believe that scientifically sound studies that address the outcomes of alternative/conservative management of CCL disease that includes more than just cage rest are needed. I was unable to find a peer reviewed article discussing the outcomes of acupuncture and related techniques alone or in conjuction with other conservative methods for CCL injuries. This case also taught me that I can trust what my hands feel and the patient’s response to myofascial palpation. Sapphira is a well-muscled dog and so her trigger points were not as easy to feel because of the overall tightness of all her muscles. Previous to this course, I would have brushed a subtle reaction off as something that was not clinically significant. However, Sapphira made it clear that there were areas that were sensitive (skin twitching) and areas that were not sensitive across her thoracolumbar longissimus. I would have liked to use laser on Sapphira in addition to the electro-acupuncture. I think this would have been a nice adjunct to treatment and may have decreased recovery time. We currently do not have a laser and so I was unable to use this modality, but in the future, I hope we can invest in a laser unit so that I can add that to my treatment protocol. In conclusion, this case has had a successful outcome so far. I am still treating Sapphira on a bimonthly schedule and she has just started swimming and underwater treadmill rehabilitation to assist in muscle restoration. DeLuke AM, Allen DA, Wilson ER, et al. Comparison of radiographic osteoarthritis scores in dogs less than 24 months or greater than 24 months following tibial plateau leveling osteotomy. The Canadian Veterinary Journal. 2012; 53(10):1095-1099. Lineberger JA, Allen DA, Wilson EW, et al. Comparison of radiographic arthritic changes associated with two variations of tibial plateau leveling osteotomy. Vet Comp Orthop Traumatol. 2005;18:13–17. Hurley CR, Hammer DL, Shott S. Progression of radiographic evidence of osteoarthritis following tibial plateau leveling osteotomy in dogs with cranial cruciate ligament rupture: 295 cases (2001–2005) J Am Vet Med Assoc. 2007; 230:1674–1679. Boyd DJ, Miller CW, Etue SM, Monteith G. Radiographic and functional evaluation of dogs at least 1 year after tibial plateau leveling osteotomy. The Canadian Veterinary Journal. 2007; 48(4):392-396.